What Day Of The Week Is December 24? 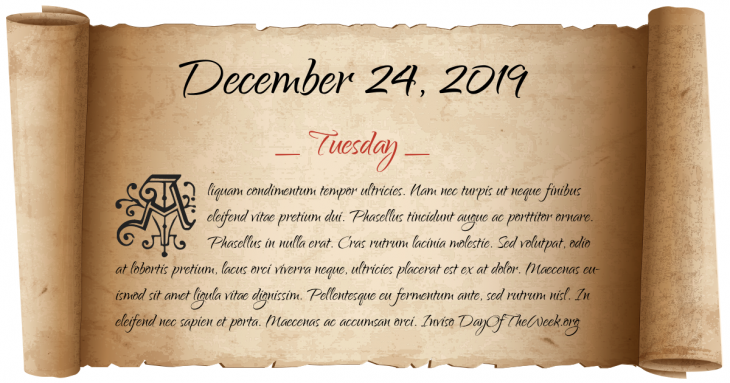 December 24, 2019 is the 358th day of the year 2019 in the Gregorian calendar. There are 7 days remaining until the end of the year. The day of the week is Tuesday. The Byzantine church Hagia Sophia in Constantinople is dedicated for the second time after being destroyed by earthquakes. Pope Boniface VIII is elected Pope, replacing St. Celestine V, who had resigned. World War II: French monarchist, Fernand Bonnier de La Chapelle, assassinates Vichy French Admiral François Darlan in Algiers. Cyclone Tracy devastates Darwin, Australia. Lord’s Resistance Army, a Ugandan rebel group, begins a series of attacks on Democratic Republic of the Congo, massacring more than 400.
Who were born on December 24?